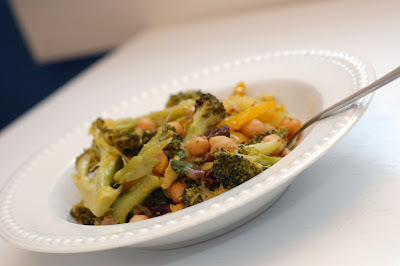 Last night, Jason ended up making up an Orange Roasted Broccoli & Chickpea Salad. I pretty much just sat back and watched. We had several oranges on hand that were going bad quickly. He had been talking about making an orange vinaigrette, so I let him just go with it. Add veggies and chickpeas to a prepared baking sheet and add seasonings. Cover with foil then removed foil and bake approximately 15-20 minutes. Remove foil and add in the orange segments and raisins and roasted til crispy. Meanwhile, in a medium bowl, whisk together all ingredients for the vinaigrette and set aside. When veggies are roasted put in a bowl and toss with vinaigrette. As an option, you can garnish with raw cashews or toasted almonds (I added the cashews after the pics). This really turned out very well. It was a lighter, refreshing kind of dish. The orange felt very clean. Definitely a great side dish for a gathering as well. This morning Jason and I got up nice and early to get in a run while it was still mostly cool. It was about 65 degrees, but the humidity made it feel like you were swimming rather than running. Thank goodness the sun wasn't up yet, so that made it bearable at least. Though, we were both puddles of sweat (nice visual huh?). We stuck to our now-typical morning route. The way we run we can do between 4-5 miles depending on the goal. Today I got in 4.5, Jason stopped right at 4. He was having one of those heavy-legs runs. Just nothing really clicking quite right. And at one point he choked on a bug and hacked for the next 2 miles. So, I can't speak for him, but for me...I had a pretty good run. It wasn't super speedy. In fact, the splits were sort of all over the map going from 9:22 to 8:55, then 9:01, I missed mile 4 entirely (I think it was right at 9 again but not really sure), but my last .5 was 8:45. It's funny to me how sometimes you can be almost spot on with even splits, but other times they go up and down like crazy. I decided to go ahead and do legs today during my lunch break (at home). I've been doing legs on Thursdays then resting on Friday. But I thought I'd try doing them on Tuesday with Wednesday's workout being used to just loosen them up and keep them moving rather than doing absolutely nothing. We'll see how it works out for me of course. This workout went by really quickly, only 30 minutes long. I did keep my rests in between the sets fairly short. After work I manged to not talk myself out of a Target run. I've been putting it off, but the list keeps growing. So, I figured I needed to go ahead and get that taken care of. I really had no good excuse to avoid it one more day. Since the sun was out this evening, we went with our planned grilling from last night: BBQ tofu, corn on the cob, and sweet potato rounds. I started marinating the tofu last night, so everything was pretty easy to prep and get going.